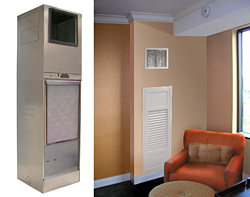 Heat Pump minimizes vibration and noise transmission to the cabinet and wall structure with vibration isolators. The Vertical Stack Water Source Heat Pump is designed for single-zone environments in multiple-floor buildings. The unit's footprint measures 18- or 24-inches square, with efficiencies up to 15.7 EER. Available from 3/4 ton through 3 tons.